Trinity Sunday is one of my favorite Sundays of the liturgical year. So, as I read blogs and preacher helps I was surprised to learn that not all worship planners share this love. In fact most seem to rather dread it or knock it as “the only festival of the church year that celebrates a doctrine.” I suspect the reason for this is that many worship planners begin planning thinking about the sermon and so start by feeling the need to preach a sermon on the Trinity that would wow their seminary theology profs and also be meaningful to the people in the pews in front of them. Old tapes about impossible term papers start playing … and it goes downhill from there. Not having to preach a Trinity sermon, I begin by saying “It is God Sunday! The call is not to explain God but to celebrate God’s mysterious, more than we can ever explain presence. What could be better!” Of course it is a chance to do a little worship education about the Trinity, but since even the Trinity is an inadequate definition of God, I suggest that this may be a better week to celebrate God than to explain God. p Having said that, I start by sending you to the post for Trinity Sunday (Year A) that begins with ideas about talking about the Trinity with children. I also add a Trinity children’s story, a suggestion for using great art to talk about what the Trinity is not, a way to invite worshipers to write a simple poem about God, and two sacrament connections before moving on to the texts for the day. pDavid Stoddard, the rector of Church Our Savior in Charlottesville, Virginia, told this story to a group of elementary aged children during worship last year shortly after Prince William and Kate’s royal wedding. (This year you might have to start with a magazine picture from the wedding - there are still plenty of them around! - to help children remember the wedding a year later.) As he talked about the wedding he recalled the use of all of Prince William’s names (William Arthur Philip Louis) in his vows. He noted that at special times we use our full names and asked the children to share theirs. He also shared his. Then he asked, “I wonder if anyone knows God’s full name.” One child offered the correct answer, “Father, Son, and Holy Spirit.” He then did a brief comment on each person in the Trinity and noted that just as all of our names are just different names for us, Father, Son, and Holy Spirit are all names for God. and claimed to be in common domain. p Display/project this piece of art. Identify each person of the Trinity in it. 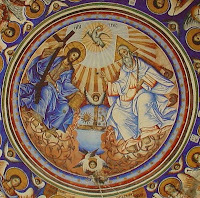 Then point out that this is an artist’s idea about the Trinity not a photograph of the Trinity. The Holy Spirit is not a bird. God the Father is not an old man. Jesus is probably as close to correct as any of the three. Go on to explain that these three figures are not actually three separate figures that could sit around in a room near each other. They are three parts of God or three ways we know God. 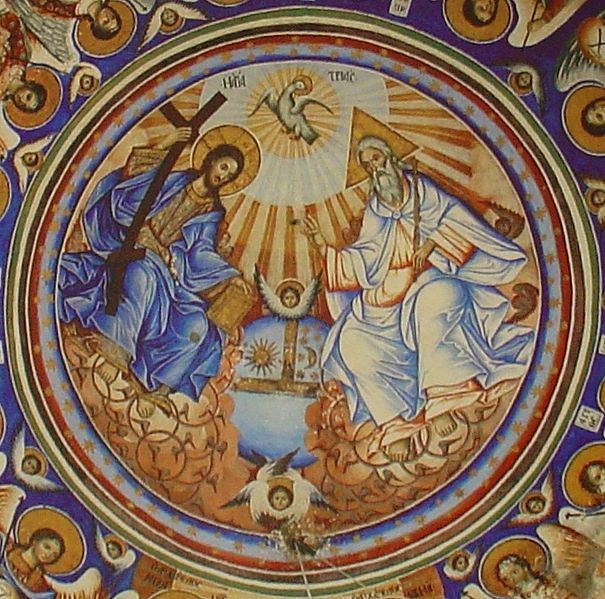 Pause before admitting that it is really hard to paint or to understand the Trinity. It is a mystery. The more we understand about it the more there seems to be to wonder about. This could be a children’s time or could be folded into the sermon to entice children to listen to it – at least for a little while. p In many congregations Communion and or Baptisms will be celebrated this Sunday. It is an opportunity to identify Trinity connections to them. Like the Trinity, Communion is a mystery. No one can fully explain what happens when we celebrate communion or exactly what it always means. Sometimes the same communion service means different things to different people sharing it. As we grow and have more and more experiences with Communion, our understanding of it grows and changes. Illustrate this mysteriousness with stories of several rather different communion experiences in your life or by interviewing several prepared worshipers of all ages about important communions in their lives. If you will baptize people today, before the sacrament read the Trinitarian formula used. Note that this is one thing shared by all Christians everywhere. We have lots of differences but we are all baptized in the name of Father, Son, and Holy Spirit. Briefly add to that saying something like, we are baptized in the name of God who created and loves each one of us, in the name of Jesus who both shows us how to live and forgives us when we mess up, and in the name of the Holy Spirit – God with us always. You might even want to pause for a short prayer thanking God for loving us in these three ways in baptism and every day. p Invite children (or all worshipers) to write a poem about God during worship using a simple format. You might offer it on a worship worksheet and then invite folks to post theirs in a set spot with or without their name or to take it home to post where they can read it and talk with God about in the coming week. Isaiah offers a mysterious vision of God on the heavenly throne. 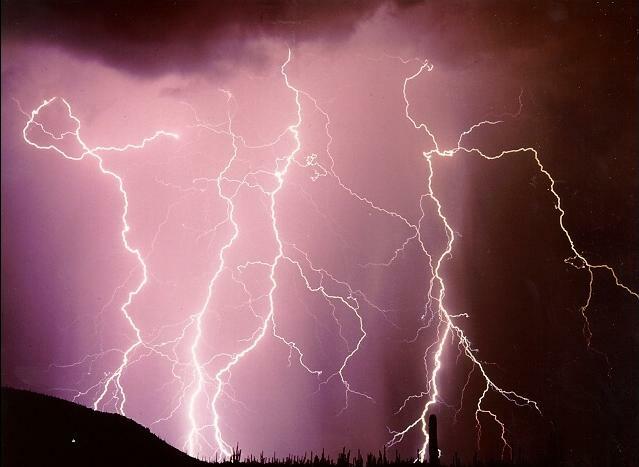 Psalm 29 describes the mysterious, even frightening power of a thunderstorm storm. Romans ponders the mysterious truth that this powerful God invites us to be in relationship, i.e. to be God’s children. And, the gospel is the story of Nicodemus’ inability to deal with mystery. Read together they set us up to ponder the mystery of God. Point out places the word is stitched, carved or painted into your sanctuary. Define holy and translate “Hallowed be thy name” in the Lord’s Prayer to “holy be your name”. Use the phrase as a congregational response in a prayer or praise litany about God/trinity. Sing “Holy, Holy, Holy” as a way of joining Isaiah and the seraphs in praising God. Have the musicians pull out all the stops between verses or on the last verse. Non-readers with the urging of people around them can sing the three holys at the beginning of each verse. p Sing “Let All Mortal Flesh Keep Silence” out of season to capture Isaiah’s feelings in the presence of God. Since tough vocabulary make this a hard song for young readers to sing, consider having it sung by the choir or a soloist in response to the reading of the scripture or after a conversation about the mysterious, awesome presence of God. p Many congregations enjoy singing “Here I Am, Lord.” Children and others with limited Biblical knowledge will miss many of the symbols in the verses. But, even non-readers can pick up on the chorus. p If you use incense in worship, this is a good Sunday to use it before reading this vision and to talk about its meaning. If you do this, what about sharing what you do and say to educate those of us who generally worship without the benefits of incense?! p If you use the great prayer of Thanksgiving in celebrating Communion, just before moving into that liturgy, point out the phrase “Therefore, with angels and archangels and the whole company of heaven, we worship and adore your glorious name, praising you forevermore:” Explain how it fits into the prayer. Practice the sung or spoken response your congregation uses. Then, suggest that when we pray and sing this every time we celebrate communion, we are putting ourselves smack dab in the middle of Isaiah’s vision. p Display and briefly discuss a couple of great art renderings of Isaiah’s vision. Then provide children (all worshipers?) with paper and crayons with which to draw their version of the scene. Invite artists to post their drawings at the close of the service on a board set of for that purpose. With their permission print some of them in the church newsletter or on the church website to encourage Sermon Art. p This is a psalm to experience and enjoy rather than explain in great detail. p Before reading the psalm together, point out the big thunderstorm images - lightning like fire in the sky making everything look like it is jumping in the flashes, the noise of thunder, and the power of the wind. Imagine being in a boat on the sea in such a storm. Then note that that God is even more powerful and great than the most powerful thunderstorm. Urge worshipers to listen for that power as the psalm is read. p Before reading the psalm, make the noise of a storm. 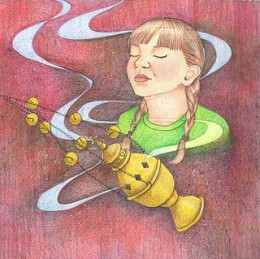 Call on musicians (children with rhythm instruments to which organ or drum are added). Or, invite worshipers to slap the backs of the pews in front of them with their hands. (This works best with wooden pews and worshipers standing.) Like an orchestra conductor signal a cut, then go directly into the reading of the psalm with whole congregation reading in exuberant, stormy unison. go to Baptism of the Lord (Year A) for directions for tracing the path of a storm in from the sea across the mountains and out into the desert and directions for coloring page activity. go to Baptism of the Lord (Year B) for congregational reading script which adds the question “How strong is the Lord?” between verses. p Find ideas about the children of God in this text at Proper 11, 16th Sunday in Ordinary Time (Year A) - if you have not exhausted being children of God reading the 1 John texts during Easter season. p Both adoption as opposed to slavery in the Roman world and the privileges and responsibilities of heirs in that world and today are complex issues. I’d focus elsewhere with the children today. a project of the Vanderbilt Divinity Library, Nashville, TN. p If this school just ended in your area, use this text to talk about the coming summer rather than to celebrate the Trinity. Display the Jesus Mafa picture of Jesus talking with Nicodemus. Ask how many people were there and what time of day it was. 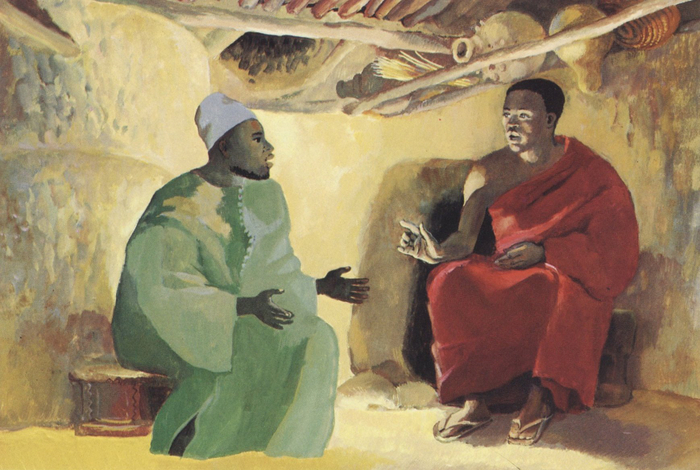 Then note that Nicodemus wanted to know about Jesus, but he wasn’t sure he wanted other people to know it. He came to see Jesus alone and at night. He wasn’t very brave. Jesus wanted Nicodemus to be braver. We know that later Nicodemus stood up for Jesus at his trial and that he bravely helped claim Jesus’ dead body and put it in a cave tomb. Conclude by challenging the children to be brave standing up for Jesus this summer wherever we are – at camp, the pool, etc. Thanks for sharing David Stoddard's idea about our names. One of our church children goes by JP; he was very surprised when he entered school and found out his "real name" was John Paul! Names are so important to us! Among the first graders I taught this year a little boy named Aaron, never once failed to note when Moses was mentioned, even in passing, that Moses had a brother named Aaron just like him. So " my name is in the Bible." Maybe God feels the same way about the three names of the trinity. I just "discovered" this site and want to let you know how impressed I am with this wonderful (and well organized!) resource. Inspiring, relevant, thoughtful. I will be coming back here often and share it with others. Thank you for sharing your experience and skills so generously! Welcome, Hubert. It is good to have you among us. Hope you will join the conversation sharing your ideas. Wow, this is great help as I prepare to preach this week. Look forward to following each week! Many thanks for this lovely blog where you share your ideas with others! Trinity Sunday's teaching for kids for our parish weekend away sessions is now well under way with lovely thoughts from you! Many thanks again! In the past, I have used Rabbi Sandy Eisenberg Sasso's book "In God's Name" about many names (& understandings) of God. Carolyn I am finding this resource so helpful in my ministry. I use your books as well. I was also one of your students at Union!!! I'm an ordained minister now and lovin my ministry here in Eastern NC. The children remain in the sanctuary for the entire service. We don't have a specific children's time, but I am always looking for ways to draw them in. Thanks for the help. You do good work.